Duramune Max 5 (Elanco) 5 way vaccine aids in the prevention of disease caused by Canine Distemper, Adenovirus Type 2, Parainfluenza, and Parvovirus. 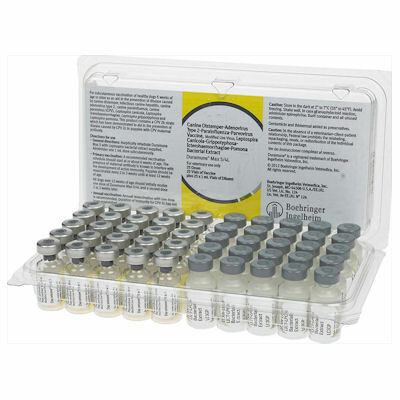 For vaccination of healthy dogs 6 weeks of age or older. Dosage and administration: Using aseptic technique, after rehydrating inject 1 ml dose IM or SQ. Vaccination in puppies should start around 6 weeks of age and every 2 to 3 weeks thereafter until 12 weeks of age, then annually.